We finish up our Bring a Friend cycle by transitioning to the final cycle of the year, our traditional year-end Smaddies Baddies year in review cycle. It’s where we get to watch many of the worst films of 2017 that we didn’t get to watch in one of our BMT Live! events. Now that we are BMT horror fans and aspiring aficionados it’s only fitting that we start by pairing one of the worst reviewed horror films of 2017 with one of the worst films of all times. That’s right we’re watching The Bye Bye ManOs: Hands of Fate. 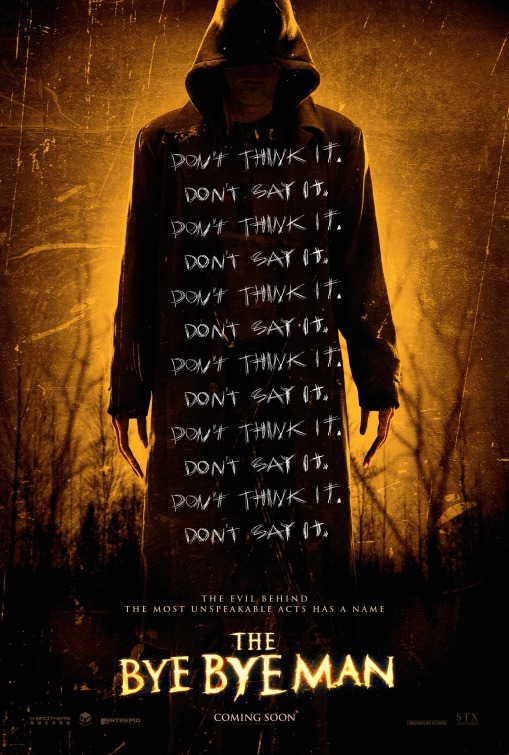 The Bye Bye Man has been on our radar ever since it’s pretty ridiculous trailers (and even more ridiculous name) that seemed to air constantly during last football season. In quite the coincidence I was also watching a past Survivor season (yes, I watch past seasons of Survivor for fun in my spare time. So what?) that happened to feature a contestant by the name of Jonathan Penner. Why is it a coincidence? Because Penner also wrote The Bye Bye Man. So it was literally seared into my brain that we must, must, must watch this film in the future. As for Manos: Hands of Fate, while it’s considered one of the worst films of all time it doesn’t fit traditionally into BMT because of its pre-1980 release. Shot in 1966 on a super low budget by a random Texan businessman/amateur theater actor I have no more expectations for this than I would a film like Birdemic. It’s just an amateurish film made by a delusional person that should never have seen the light of day. Will likely be a bore, but that’s what this cycle is all about. Finding out whether these categories are as boring as we assumed when we precluded them. Let’s go! RogerEbert.com – 0.5 stars – Both as a straightforward horror exercise and a look at the perils revolving around off-campus housing in Wisconsin, “The Bye Bye Man” is the kind of film that is so boring and bereft of anything of possible interest that it becomes infuriating. Rotten Tomatoes – 23% (16/69): The Bye Bye Man clumsily mashes together elements from better horror films, adding up to a derivative effort as short on originality as it is on narrative coherency or satisfying scares.